2 old jibs + 1 championship jib, 1 old main + 1 championship main, 1 very old spinnaker (well used) + one championship spinnaker. 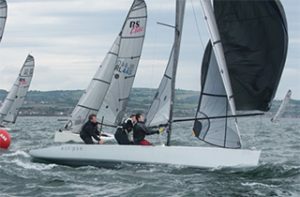 (Championship sails will have been used in 5 events only at time of sale – pictured above). Tacktick mast instrument (wireless) depth, boat speed, timer, heading, x-trk etc. (solar powered). 2-wheel braked Road Trailer with unused spare wheel attached, lockable ball hitch & jockey wheel. (Boat dry sailed only). Harken fittings throughout, cockpit cover, main sail cover, 2 paddles, outboard side mount bracket (unused) Anchor & warp, bucket & 2 fenders. Long & short carbon tiller extension. Light weight Hawk. All ropes Dyneema, spare spinnaker halyard & spinnaker sheets. Spare new spinnaker Shute cover, and a few kicker /vang covers, 2 cockpit bags (presently not fitted), a hatch spanner etc. Full mast sock (in 2 pieces) or UV protection. Spare mast track repair kit. 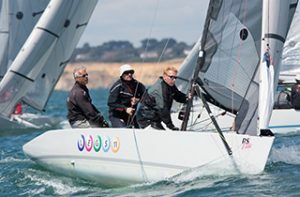 This boat has a good track record 6th British Nationals 2016 (Inc. 2 firsts), 4th & 2nd Irish nationals 2016 & 2017. The hull was soda blasted then faired, epoxied & 2 coats of hard racing grey International anti-foul as per class rules in 2016 so a very smooth hull and minimal water absorption. She has been shed stored since Oct 18 and has not been sailed this year to date. Should the boat be sold to the mainland, we will assist as best possible and pack the boat and deliver to any N.Ireland ferry terminal for shipment to Cairnryan, Heysham or Liverpool. Reason for sale – last Elite at our club so no one design racing.